Hedge garlic is a European annual or biennial plant; the blue-green, usually simple stem grows to 3 feet high and is mostly glabrous but thinly hairy at the bottom. The leaves are glabrous and coarsely serrate, the basal reniform, the stem leaves cordate to almost triangular. When bruised, they smell like garlic. The small, white flowers grow in a broad raceme from April to June. Grows along roadsides, hedges, walls, fences and among bushes. Used much like garlic (Allium sativum). 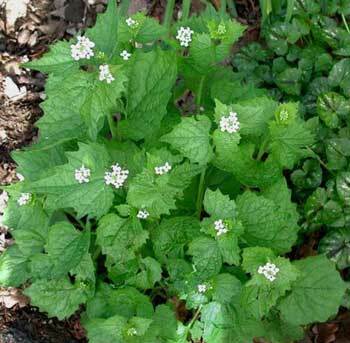 Hedge garlic is a springtime tonic and is used to help rheumatism, gout, and asthma. As with mustard, skin irritation can result from use of the plant as either a poultice or a plaster.